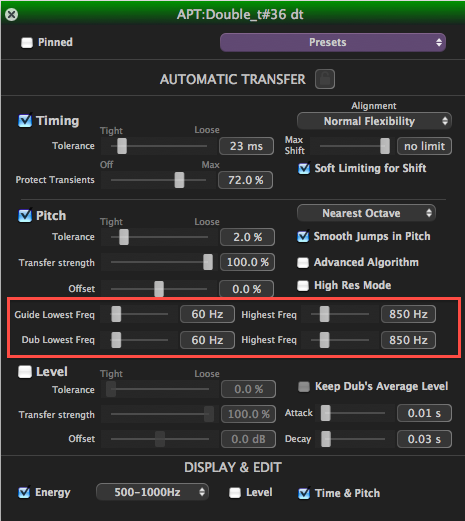 Vocal signals with very low or rough pitch, or even bass guitars and flutes can be used successfully as inputs to Revoice Pro and be automatically aligned or manually tuned. You can also prevent transferring octave jumps that occur in one signal to another signal that doesn't have them. You will only know that you have a problem if you hear it (e.g. artefacts in the output of an APT or manual pitch adjustment process) or see it in the Revoice Pro displays. Since hearing it is going to be the most common means of detection, in this section we explain below how to display the problems, make corrections and see (and hear) the result.